Underscoring the importance of the Brazilian market, Dassault Aviation is continuing to build up capabilities at its company-owned service center at Sorocaba Airport in São Paulo to accommodate an expanding customer base and fleet in the region. Remy St-Martin, who stepped in earlier this year as senior v-p and COO of Dassault Aircraft Services, said the center, which next year will celebrate its 10th anniversary, has also expanded its services and outreach throughout Brazil and the Latin America area as customer requirements have evolved and grown. In the past year, the Sorocaba center, known locally as Falcon do Brasil, has added tooling for Falcon 7X and 2000 B-checks for Brazil-registered aircraft. This represents an investment of more than $100,000 in tools, along with training. The center has long conducted A-checks and St-Martin called B-checks the next step in its progression of support in the region. This enables customers to remain more local rather than travel out of the country for the more extensive, longer-term inspections, he said, noting the first B-check has been completed and the customer “was very happy” that it was accomplished closer to home. Dassault Aviation also brought its Pre-Purchase Evaluation (PPE) program to Sorocaba. Rolled out as a formal program in the past year, PPE is designed to provide potential customers of pre-owned Falcons an experience equivalent to that provided for customers of new aircraft. The program covers a range of services from detailed aircraft evaluations to a complete walkthrough of updates necessary to meet upcoming requirements such as ADS-B Out and Fans-1/A. Assessments include physical-evaluation records research, systems operational checks, and other comprehensive evaluations. The Dassault support teams further coordinate on propriety modifications and “engineered solutions” designed to keep the existing in-service fleet at the level of new production aircraft. While the center hadn’t received a number of requests for such services in the past, Dassault brought the program to Sorocaba to assist with the exchange of an aircraft between Brazilian customers, he said. This enabled them to conduct the necessary checks more regionally rather than having to send the aircraft to the U.S. for examination. It also positions the center for a used market that has picked up in the region. Dassault has steadily invested in the Sorocaba facility since it opened in June 2009, including increasing staffing and stocking millions in spare parts. The 23,000-sq-ft center has been equipped to provide line maintenance and airframe inspections for all Falcon models except the Falcon 10, Falcon 20, and Falcon 200. In addition, the facility is qualified to provide engine maintenance on a suite of engines powering Dassault business jets, including the GE CFE738 on Falcon 2000 variants, Honeywell TFE731 series engines on Falcon 900s, and Pratt & Whitney Canada PW307A (Falcon 7X), PW308C (Falcon 2000), and PW307D (Falcon 8X) models. Sorocaba further has been equipped to dispatch an AOG team to support Falcons throughout South America. The center has obtained certifications from the FAA, EASA, Brazil, Brazil, Bermuda, and Uruguay to work on aircraft. These certifications come as the center is seeing an increasing number of transient aircraft, St-Martin said, with more flying longer missions. The long-range aircraft have strong demand in Brazil, in particular. In fact, four of the first fifteen 8Xs delivered went to Brazil. The Sorocaba center—which is led by Gutemberg Silva, who was the center’s first employee—has provided differences training for the technicians to work on the 8X, St-Martin said, but added these technicians have been well prepared for the new model that shares many of the systems as its 7X sibling. “We’ve built a fair amount of aptitude on the 7X,” he said, noting this benefits support for the 8X. 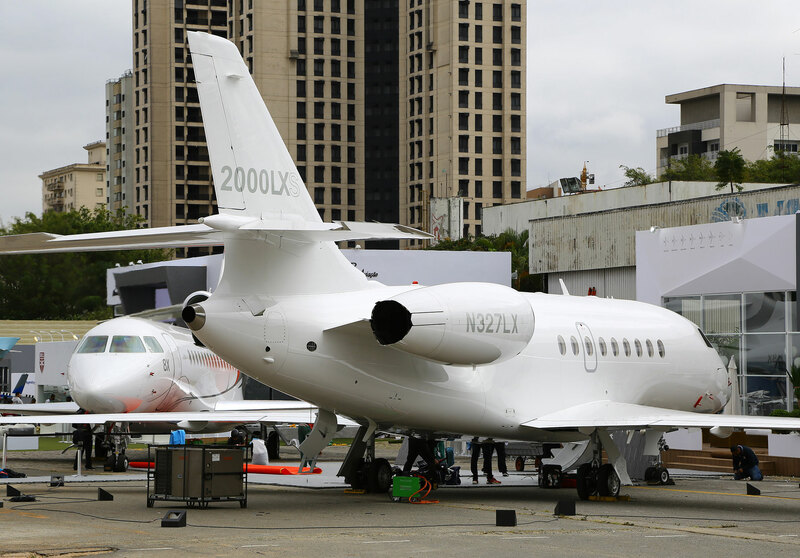 The Falcon 2000 also attracts solid interest, and as such, the French manufacturer brought its 2000LXS along with the 8X for the static display at LABACE. The display of the 6,450-nm trijet 8X is becoming a mainstay at LABACE, having made its debut at the Latin America show in 2016 shortly after receiving FAA and EASA certification in June of that year. It returned in 2017, months after receiving Brazilian ANAC approval. While the two in-service Falcon models will be on static, Dassault Aviation (Chalet 5116) is providing a virtual glimpse of its 6X, the recently announced successor to the canceled 5X. The virtual reality display will provide an opportunity to showcase the enhancements the company is incorporating on the PW812D-powered Falcon, which has increased thrust, 300-nm's more range, and a 20-inch larger cabin than the 5X would have had.